Ruthenium is a PGM and a Noble Metal that is mostly used in Catalysts. Ruthenium has been gaining popularity in the medical community for many uses. With its close relations to Platinum, it share many of the same qualities however, Ruthenium displays in the scientific community the ability to enhance other treatments. As a magnifier, Ruthenium often times provides users with more energy, faster memory recalls and retention. Also, lucid dreaming is common with the use of Ruthenium. Ruthenium will modify the DNA. Ruthenium replaces Iridium on the end of DNA chains. DNA double helix with ruthenium ORME on the ends creates a highly conductive path along the axis of the molecules of the DNA, the current goes from approximately 100 electrons per second to over 1,000,000 electrons a second. Without Ruthenium, DNA double helix conducts up to 100 electrons a second. In a Scientific American article it was stated that when single ruthenium atoms were placed at the ends of a short strand of DNA, it becomes 10,000 times more conductive, in effect becoming a superconductor. The current goes from approximately 100 electrons per second to over 1,000,000 electrons a second. It’s like going from dial-up AOL speeds to Fiber Optic speeds. In addition, a major American pharmaceutical company announced that ruthenium corrects malformed DNA. Malformed DNA is a direct reference to physiological conditions that run counter to how the body and its systems should function most naturally and therefore most effortlessly. It is associated with enabling us to use more of our brains capabilities. It’s used for increasing our connection speed to communicate with God. Ruthenium is an interesting metal which in and of itself isn't that strong, but lends strength when added to gold or platinum. 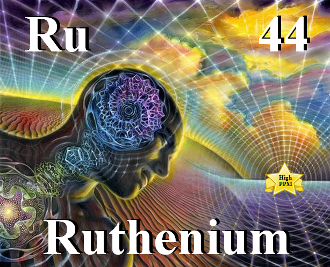 For energy magic, Ruthenium can be a good choice when we need a catalyst to lift existing strengths and qualities to the next level.